These Biblical Times Joseph costumes from Forum will have you flocking the herd and bestowing peace on thy neighbours this Halloween and Christmas! Costume includes the overcoat. under robe, rope-belt and headpiece. 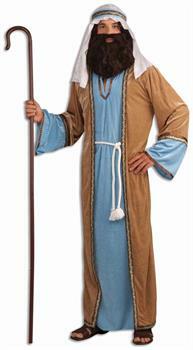 Please note that wig, beard, sandals and staff are not included. 1-size fits most for men is approx 42" chest.